This System for Analysis at the Liquid Vacuum Interface, or SALVI, enables for the first time imaging of liquid samples in real-time and space by more than one analytical instrument. It eliminates the need for sample preparations such as freezing or drying biological cells. Enlarge Image. Many studies rely on precise knowledge of how solids and liquids interact on a molecular level, but liquids evaporate in the vacuum of certain instruments. 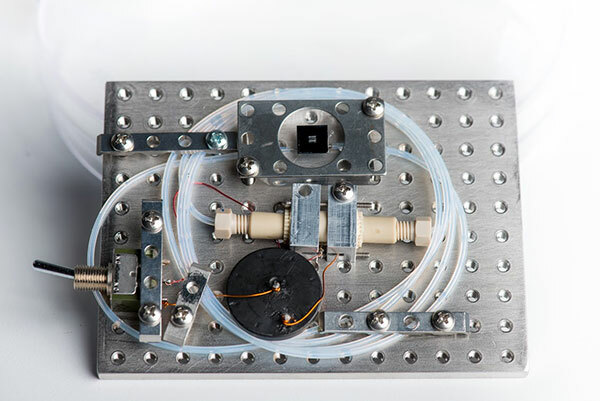 Pacific Northwest National Laboratory developed the System for Analysis at the Liquid Vacuum Interface, or SALVI, that for the first time allows these instruments to image liquid samples in real-time and space. Today, R&D Magazine honored SALVI’s research team with an R&D 100 award. R&D Magazine selects the 100 most innovative scientific and technological breakthroughs of the year from nominations spanning private, academic and government institutions. With SALVI, scientists can gain new insights about nanoparticles, bacteria, batteries and more. The portable system fits on a block the size of half a sheet of paper. It connects with many types of vacuum-based instruments, including time-of-flight secondary ion mass spectrometers and scanning electron microscopes. SALVI can take a sample as small as two drops. The sample flows through a channel to a window the size of a pinhole, where an ion beam performs analysis. Surface tension keeps the liquid from escaping the window. The flow and small window reduce evaporation in a vacuum and protect the sample from beam damage, making many forms of liquid analysis possible. SALVI enables imaging in real-time and space by more than one analytical instrument. And it eliminates the need for sample preparations such as freezing or drying biological cells. Structure Probe Inc., based in West Chester, Pennsylvania, has licensed the patents covering the technology and plans to introduce a commercial version of SALVI by the end of the year. The team recognized for developing SALVI includes PNNL’s Xiao-Ying Yu, Martin Iedema, Bingwen Liu, Zihua Zhu, and Matthew Marshall; former PNNL staff member James Cowin; and Evans Analytical Group’s Li Yang. The team developed SALVI in collaboration with scientists at EMSL, DOE's Environmental Molecular Sciences Laboratory user facility at PNNL. Today's honors bring PNNL's total to 93 since the awards' inception in 1969. Other 2014 winners were Avegant’s Glyph™, a headset display that contains a PNNL-developed virtual retinal display, which reflects light onto the back of the viewer’s eyes. Because the display mimics natural vision, it reduces nausea and eye strain even with extended use. The team recognized for developing Glyph™ includes PNNL’s Bruce Bernacki and Avegant’s Allan Evans, Edward Tang and Neil Welch. In addition, the Solar Thermochemical Advanced Reactor System, or STARS, was recognized. It converts natural gas and sunlight into a more energy-rich fuel called syngas, which power plants can burn to make electricity. The team recognized for developing STARS includes PNNL’s Robert Wegeng, Paul Humble, Robert Dagle, Daryl Brown, Dustin Caldwell, Richard Cameron, Richard (Feng) Zheng, Brad Fritz, and Ward TeGrotenhuis; former PNNL staff members, Shankar Krishnan, Steven Leith, Dan Palo and Jair Lizarazo-Adarme; and DiverSolar LLC’s Richard Diver. R&D Magazine will honor award winners November 7 at an event in Las Vegas.